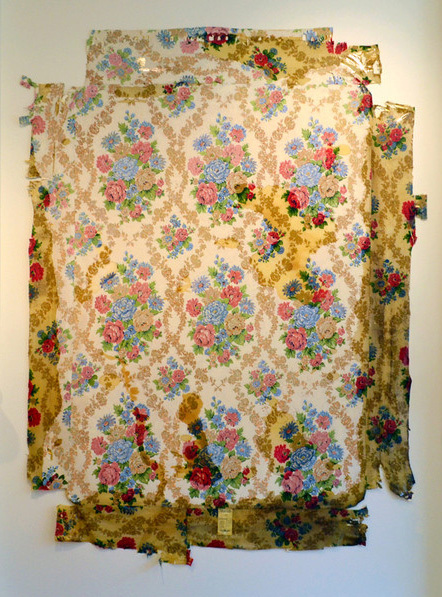 In this painting, Anna Kell has preserved and embellished existing stains and discoloration on the fabric of a found, discarded boxspring. For most people a stain signifies something unpleasant, something one is not supposed to see or acknowledge. Kell is interested in this automatic, negative reaction that people have to something very natural and physical. By re-framing these accidental marks as the main imagery in the work, she hopes these stains can be read as painterly marks that have value and which speak to our connection to nature and history.